I will be attempting to activate Le Prarion F/AB-362 on Saturday 15th and if successful will then do so each day until the 23rd. I might be able to activate others, but this is essentially a skiing trip and riding with my 3 year old daughter is really the priority (if I can keep up with her :-)). The summit is approximately 150m above the ski area and I expect it will have deep snow cover. Propagation predictions (hamcap) indicate that in the morning, G, GW, ON, DL. OE, HA will be strongest on 40m with GI, EI, GM strongest on 20m. The 9X0R Rwanda Dxpedition is also active during this period and my goal is to work them from the summit. 20m - 10m are all predicted to be strong. 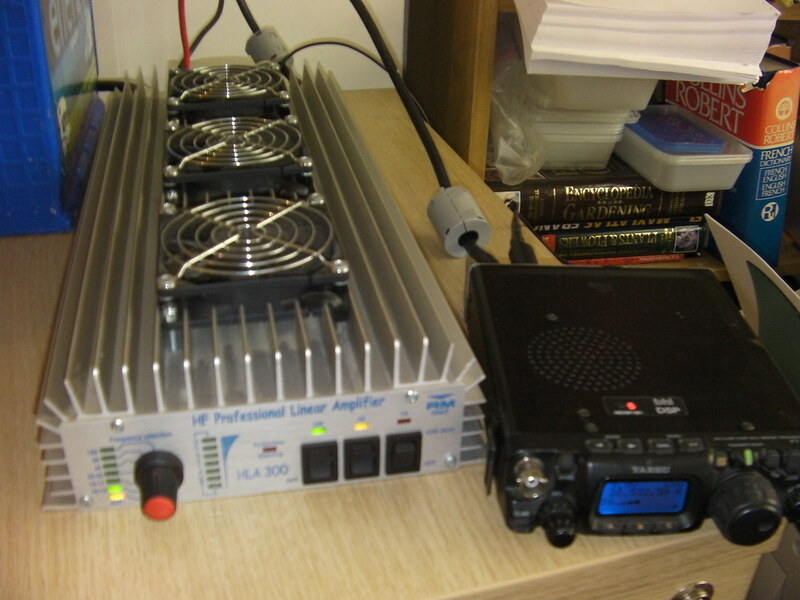 I will be using a ft857d with 7ah SLAB, which somehow manages to put out 118 Watts and should last an hour approximately. Hope to catch you all on air. Good luck for 9X… ! and welcome to this wonderful valley. Thanks to everyone that called today. A total of 31 contacts. Apologies for the quick activation and terminating abruptly. It was snowing heavily and with no shelter the wind chill got to me quickly. I cancelled the activations for last weekend. On Sunday I did ski in Jura at La Vattay 1300 m in wet snow fall, but it was not really pleasent. If you do more off-piste activations, you will probably need to get an ARVA (avalanche transceiver), snow shovel and snow probe. This is the standard equipment in Alps. Unfortunately the wx does not look very promising for this week. It snowed here all night and day. The Skiing is fantastic, no need to go off piste, deep powder everywhere !. Sota on 40m was ok with 18 contacts. A shift to 20m added nothing. A further move to 17m proved productive with 3 USA and 1 Canadian station answering my cq. My callsign proved to be difficult for some of the US statios. I am also not convinced my audio is ok, any comments would be welcome ? The snow grooming machines are out tonight, so I think tomorrow is going to be a carving day. A day off from Sota tomorrow. Glad to work you on 40m yesterday. Regarding your audio. I did find it rahter “heavy” to listen to. A bit like you are holding a piece of cloth over the mike. It was understandable but on a scale to 10 for confortable listening I’d say 6/10. I am also not convinced my audio is ok, any comments would be welcome ? I monitored your activation on Sunday; indeed tried calling but my QRP signal could not break the pileup. Since you ask, I found the audio a bit muffled. I have a high noise level, and although your voice was quite loud, it did not really penetrate and I found it a bit difficult to make out what was said. It wasn’t bad enough to mention if you hadn’t asked for a critical report, but I can well imagine that some might have had difficulty making out the unusual callsign. I agree with the others, the audio is a bit muffled and bassy, are you using a Yaesu mike with the rear switch on setting 1? If so try 2! Thanks for the feedback, I will try and fix. On early tomorrow. It was a slow walk up to the summit today, I losr the track and had to retrace a couple of times. The wearher at the start was perfect. 47 contacts were made on 40m & 2 on 20m. It then started snowing and visibility dropped so it was time to go. I have changed the audio on the ft857d and would welcome feedback. Current settings are mic switch=2, proc = 50%, gain = 50, dsp equaliser = hpf. I certainly felt more readable today. Your audio was spot on today Nigel, I would leave it as is now. Brilliant: that’s my first try at 14MHz & my local noise was strong. I listened to you on 7MHz but the 30yr old FT7 was struggling with adjacent strong signals & it sounded like you had QRM problems too. Heard you announce 14.285 & went straight there…thought it would be hopeless so started doing something else…then you appeared just above the noise. Could hardly believe that you heard me first time - the FT7 puts out 15w into a non-resonant dipole which was cut to fit the attic. Thanks Nigel, enjoy the rest of your week. Thanks for the feedback. Glad to have worked you on 20m Derek. Tomorrow morning will probably be the last activation. Also some of the summit last summer with my “just about portable” 20m moxon beam. The elements are made from #14awg flexweave wire (Only because they model perfectly using MOXGEN and EZNEC). The spider is a folding construction, using ali tube, ali angle and a few bolts. The mast is a commercial cheap portable 10m aluminium telecopic type, which I have cut down to 5m. Its also been modified to allow me to turn and lock it. The support is an aluminium folding tripod and its guyed at a number of points. It goes up like an umbrella. Its relatively heavy and its quite slow to put up, but I am working on it. For example the flexweave wire is quite heavy and could be replaced with something thinner, without any real loss of performance. I have experimented with building lightweight lattice style, fiberglass masts, which shows some promise.